(Nanowerk News) Hydrogen is a clean and renewable energy carrier that can power vehicles, with water as the only emission. Unfortunately, hydrogen gas is highly flammable when mixed with air, so very efficient and effective sensors are needed. Now, researchers from Chalmers University of Technology, Sweden, present the first hydrogen sensors ever to meet the future performance targets for use in hydrogen powered vehicles. The researchers' ground-breaking results were recently published in the prestigious scientific journal Nature Materials ("Metal–polymer hybrid nanomaterials for plasmonic ultrafast hydrogen detection"). 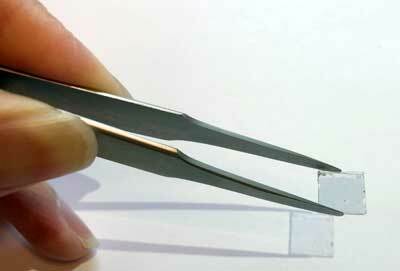 The discovery is an optical nanosensor encapsulated in a plastic material. The plastic around the tiny sensor is not just for protection, but functions as a key component. It increases the sensor's response time by accelerating the uptake of the hydrogen gas molecules into the metal particles where they can be detected. At the same time, the plastic acts as an effective barrier to the environment, preventing any other molecules from entering and deactivating the sensor. The sensor can therefore work both highly efficiently and undisturbed, enabling it to meet the rigorous demands of the automotive industry - to be capable of detecting 0.1 percent hydrogen in the air in less than a second.